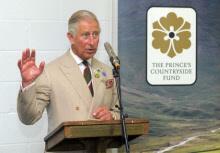 Royal approval of the work the PBKA is doing was forthcoming at the Royal Welsh Show. At a reception held at the show to launch the latest round of funding by the Prince’s Countryside Fund; Paul Eades, Apiary Manager for the PBKA met HRH the Prince of Wales, for what turned out to be quite a long discussion on the Pembrokeshire Beekeeping Centre and the plight of the honeybee! HRH demonstrated a real interest in bees and the work the PBKA was doing and was very pleased when he heard what we had achieved to date at Scolton Manor. Thanks are extended to HRH the Prince of Wales and the Princes’ Countryside Fund for their kind invitation and ongoing support. any plans on running courses? Well done Paul,It’s very important to keep our success in the public eye, especially now in difficult times for the bees and the beekeepers. With Royal sanction its newsworthy. Sir Eades?! Has a ring to it! !